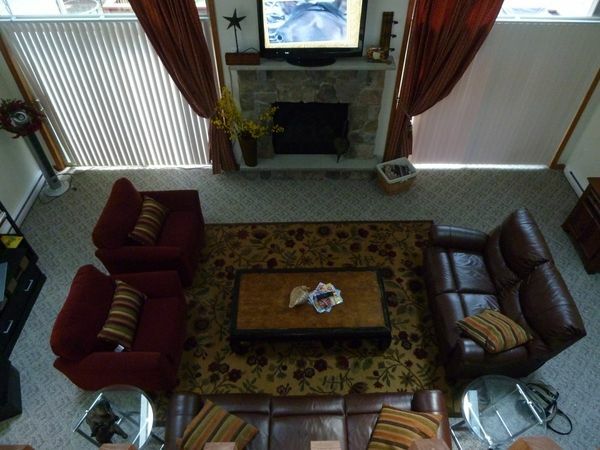 Family retreat in private com.-lakes, pools, sport courts, fishing and hiking. This home is 6 years young and has everything you could want in a perfect country retreat. The charm and privacy of a mountain home with a contemporary feel. 4 bedrooms - Master with Queen bed & on suite bath; 2nd with full and bunk bed; 3rd has full and bunk bed; 4th has Daybed (1 queen with real mattress). Open floor plan features spacious great room with plenty of seating around the fireplace, modern kitchen stocked with everything needed to cook, set and serve for 16 guests. Loft with large card/game table including a bookcase full of boardgames, books and puzzles for the whole family to enjoy. Large Florida room to enjoy take in the country air. Large deck with outdoor furniture and gas grill. 3 flat screen TV's with 3 DVD players along with a decent DVD library, Stereo system with IPOD jack and CD player and WiFi. Attached garage has 2 adult and 3 children's bikes, 4 beach chairs, beach toys, ice skates, and sleds. Outdoor slate patio with fire pit. Blankets and pillows supplied but you will need to bring your own linens. Amenities at Big Bass Lake: Big Bass Lake is a year round resort and hosts a Recreation Center with an arcade, game room and sauna. There is a heated indoor and 2 outdoor pools as well as swimming beaches on the lakes. Guests can enjoy the clubhouse with snack bar, and there are both tennis and volleyball courts on the grounds, with equipment that can be signed out. Canoes, rowboats can be rented at BB Lake. Badges required for all amenities. Our home is also located 15 minutes from the new Kalahari Resort that offers day passes for their beautiful indoor water park - fun for the whole family. Summers are mild with temperatures rarely climbing above 90 degrees. Fishing is very good in the spring, summer, and fall. All three lakes at Big Bass Lake are stocked with largemouth bass. There is excellent trout fishing on the Lehigh River. Anglers need a Pennsylvania fishing license to fish either the lakes or the river. The Pocono Mountains receives an avg of 60 inches of snow every year. In the winter you can ice skate on the big lake and downhill ski and snow tube at the resort's private ski slope with T-bar. Located in Gouldsboro, Big Bass Lake is near restaurants, shopping, several golf courses, indoor waterparks and the NASCAR Pocono Raceway. Big Bass Lake is also next to Gouldsboro State Park. The 2,800 acre park has trails for hiking, biking, and cross country skiing. Ice fishing is popular during the winter, and anglers can fish for bass, pickerel, yellow perch, catfish, and sunfish. Hunters will find healthy populations of white tailed deer, turkey, snowshoe hare, and black bear, and there is trapping for fur bearing animals including muskrat, mink, beaver, fox, coyote, and raccoon. Big Bass Lake is near Tobyhanna State Park. Spanning Monroe and Wayne Counties, the 5,440 acre park has primitive camping, hunting, picnicking, and hiking. The 3.3 mile long Yellow Trail runs through the Black Bear and Bender Swamps Natural Area. There are also wetlands and boulder fields which are a visual reminder of the area's glacial past. there are 2 lakes in the Community. You can rent canoe's and rowboats at Big Bass Lake. Both lakes are stocked for fishing. Fully stocked with everything from flat wear to serving, including outdoor bbq. Badges required to use Big Bass lake amenities for ages 13+ Daily pass: $4 weekday; $6 weekend/holiday Weekly Pass: $20; $25 Holiday week discounts given for long term rentals. We rented this house for two days, with two families comfortably sharing the space. The house was wonderful, everything was clean and orderly upon arrival, the instructions on how to turn on the heat and water clear as day. We had a great time using the backyard space for barbecue and even taking out the provided bicycles to explore the community! Overall, the house was cozy and inviting, a perfect retreat into the wilderness! We stayed here with friends and their families for the weekend. The property was very comfortable and we enjoyed the amenities of Big Bass Lake. The only criticism I have is that some of the community staff were not very helpful or pleasant. However, the host was very responsive, provided all the information we needed, and answered my questions even before I thought of them. We stayed during the summer as a last minute, multifamily getaway. The house was very spacious and had everything we needed during our stay. The community pool, lakes and other recreational offerings are conveniently located. The back deck and fire pit made for very relaxing evenings. The owner was very responsive to my inquires and overall very pleasant to communicate with. The booking and accompanying information was very organized and complete. We will definitely consider returning again! We had a great time, the pictures are reflective of the house. The indoor pool and sauna at the clubhouse were great too. Cozy but roomy house, with great light in the day time and fire pit at night! My friends and I had a great time staying here. We especially enjoyed the fireplace and the fire pit! Perfect for a big family or group of friends. The owners were very informative and pleasant, would 100% recommend to others. This house has got everything you can wish or think to be in a vacation home or even your home. The actual house is far better than the pictures shown here. I loved the house, the community, the beach, the neighbors, the woods. I got a feel that the owners have kept this house as if they are living there. I would give 5 stars to this house! Other Activities: indoor and outdoor pools. Basketball Courts, tennis courts, playgrounds, boat rentals in community. Badges are required (for ages 13 and up) to use all amenities. Golf: There are 22 Golf courses within a 40 minute drive of Big Bass Lake, the closest public course is within 10 miles. Indoor Water Parks: The new Kalahari Resort is 15 minutes away from our house and they offer day passes. H2O is 25 minutes away and also has the option of day passes. Ski: There are 5 ski mountains featuring both traditional skiing and snowboarding. These are Camelback, Jack Frost, Big Boulder, Shawnee and Montauge.